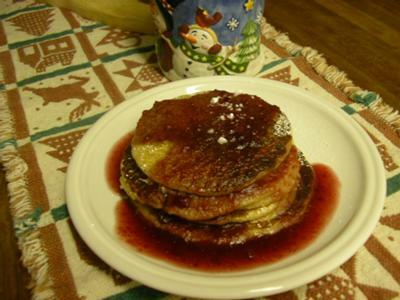 These Wheat Barley Pancakes with Cranberry Syrup are perfect for a healthy Christmas breakfast. A woman at my church gave me this recipe when I was first married. My kids loved them so much they wanted to make them every day. Our family likes to buy bulk foods, and try out different grains. I think it is great that the kids know where flour comes from. We've experimented and changed the recipe by adding other grains like corn, barley, millet, rice, buckwheat, and kamut. We like this version. The syrup came about this Thanksgiving when I discovered after making pancakes that we were out of syrup, with little sugar in the house. My husband pulled out a can of cranberry sauce and said, "How about this?" We loved the result. This really is easy. Ingredients are easy to find in the bulk section of health food stores and some larger grocery stores. Put the first three ingredients in the blender and then blend on high for 2 minutes. Blend for a very brief time as the batter will begin to rise. Fry on griddle. It makes enough for a small family of four. Place all ingredients in a small sauce pan. Mash cranberry sauce, and mix with a whisk. Heat on high until it just starts to bubble, keep whisking from time to time. Serve warm on top of pancakes. *Add whip cream and top with chopped pecans for fun. I haven't tried the syrup but these are by far the easiest, tastiest and healthiest pancakes....thank you for sharing!! I love these pancakes not only for the nutritional value but for the speed and simplicity in making them. My kids have made them with no help from me. These pancakes look sooo good, I think I will try it this week. The cranberry syrup is sure to be a pleaser. Thanks for the suggestion. I called this recipe healthy because it uses the whole grain of wheat, freshly ground. Whole wheat has high levels of protein, fiber, iron, B vitamins, thiamin, niacin, magnesium, phosphorus, and zinc. Barley is rich in the nutrients niacin and iron. I prefer whole wheat flour to white flour because, white flour has had the bran and germ layers removed to prevent spoilage. It is also bleached with chemicals and preservatives are added. I prefer freshly ground flour, because within the first 24 hours after grinding, wheat has lost 45% of it's nutrients and by 72 hours it has lost 90%. By blending the whole wheat you quickly get fresh whole wheat goodness with all of its nutrients. If you know it is healthy,why not find out and add the nutrition facts to this page? Great nutrition info, a yummy, healthy snak. but i think you should have a little less syrup. Return to Holiday 2009 Contest Invitation.